For the sake of clarity I have not updated the terms used in this pattern due to the unique nature of some of the instructions. The large mat illustrated is comprised of eight medallions sewn together. Two skeins of pale blue, one skein of pale yellow, and four skeins of light ecru shade in embroidery cotton (I’m guessing this is the same thickness as #20 mercerised cotton after seeing the range of vintage embroidery cottons available in local antique stores and considering the size of the needles used), a set of four No.14 (2mm) double pointed knitting needles, and a no 14 (2mm) crochet hook. Using yellow thread and crochet hook work 5 ch and join into a ring. Work 5 dc into a ring and join with a slip-st.
Cut yellow and fasten securely. Join in blue and, using the crochet hook, pick up 6 sts around the ring and place on the first knitting needle. Pick up four more sts and place on the second knitting needle. Pick up 6 sts and place on the third knitting needle. Now use the fourth knitting needle and k the 16 sts. 1st Round: * M1, k2tog, Rep from * to end. 2nd Round: * Increase 2 sts, k1. Rep from * to end. 3rd Round: * K1, m1, k2. Rep from * to end. 4th Round: * K1, increase 2 sts, k 2. Rep from * to end. 5th Round: * K2, m1, k3. Rep from * to end. 6th Round: * K2, increase 2 sts, k3. Rep from * to end. 7th Round: * K1, k2 tog, m1, k2tog, k2. Rep from * to end. 8th Round: * K2tog, m1, k3tog, k1. Rep from * to end. 9th Round: K1 st and slip it on to the right needle, then cut the blue thread and fasten securely. Join on the ecru shade and pick up the thread from the earlier m1, and into this double thread * increase 8 sts, k3tog, increase 3 sts (in the double thread), k3tog. Rep from * to end. 11th Round: * M1, k2tog, k2, m1, k2, k2tog, m1, k2tog, k1, k2tog, Rep from * to end. 12th Round : * K4, increase 6, k7. Rep from * to end. 13th Round : * M1, k2tog, k2, m1, k6, m1, k2, k2tog, m1, k3tog. Rep from * to end. 14th Round : Cast off very loosely, using a No. 9 needle to ensure looseness. Make seven more medallions and sew together neatly. Make four medallions each for the smaller mats and join in the same manner. 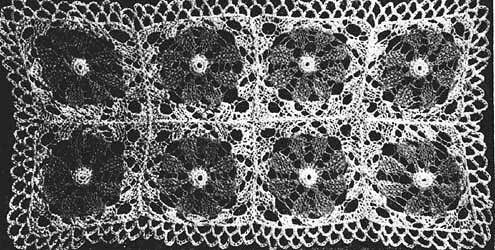 The edge is worked in crochet in ecru shade. 1st Round: Join thread, then 6 ch, miss 1 st, 1 dc into next all round. 2nd Round: Slip st to centre of first ch loop. * 6 ch, 1 dc into centre of next loop. Rep from * all round. Put through weak starch and press. This pattern is public domain. Digital version of this pattern is Copyright © Sarah Bradberry June, 1998.